A Fire Support Specialist is a member of the Army's field artillery team. Artillery are weapons that fire large ammunition, rockets or missiles to support infantry and tank units in combat. The Fire Support Specialist, which is military occupational specialty (MOS) 13F, is primarily responsible for leading, supervising or serving in intelligence activities such as target processing for artillery units and brigade maneuvers. Soldiers in this job are critical to on-the-field combat operations. They're responsible for operating radio wire communications and speech security equipment. This might include encoding and decoding messages, as well as establishing and maintaining equipment. They'll help train subordinates in support procedures and tactics, and lead and train the forward observer team in combat operations. There's a fair amount of what might seem like clerical work involved too, including preparing fire support situation plans and maps, status charts, capability overlays, target lists and other coordinating documents. These are all important parts of the job, even if they're not as exciting or urgent as the on-the-field duties. Soldiers in MOS 13F also assist in operating equipment like laser range finders, target designation and night observation devices. These soldiers are also responsible for maintenance on section vehicles and generators and participate in organizational maintenance of equipment. In combat situations, MOS 13F soldiers will prepare observer target lists and assist in formulating offensive and defensive fire support plans. They'll also request and adjust field artillery, mortar, and naval gunfire. These soldiers may be called upon for suppressive and screening fire, selecting observation posts, orienting maps and preparing terrain sketches and diagrams. In short, they're a crucial part of any Army unit where firing weapons will be used. 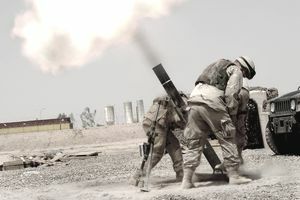 To qualify for MOS 13F, you'll need an Armed Services Vocational Aptitude Battery (ASVAB) test score of 93 in the field artillery (FA) aptitude area. The subtests for this area include arithmetic reasoning (AR), coding speed (CS), mathematics knowledge (MK) and mechanical comprehension (MC). You'll also need to be able to qualify for either a confidential or secret security clearance, which will involve an investigation into your character and conduct. The investigation will look at any criminal record, your finances and overall stability to determine if you're eligible to have access to national security information. A history of drug or alcohol abuse may be disqualifying. Normal color vision (no colorblindness) is required, and soldiers in this job must be U.S. citizens. Job training for a fire support specialist requires 10 weeks of Basic Combat Training and six weeks of Advanced Individual Training (AIT) with on-the-job instruction. Part of this time is spent in the classroom and part in the field under simulated combat conditions, learning to use the equipment you'll use in the field. The AIT for MOS 13F is an eight-week course taught at Fort Sill in Oklahoma. Some of the skills you'll learn in this MOS include ammunition techniques, operating gun, missile and rocket systems, and artillery tactics, techniques, and procedures.